I first met Claudia V. Angelelli a couple of days before the launch of the EIRSS last June. She was very enthusiastic about the research summer school and super-efficient. In the space of 30 minutes, she managed to have a chat and catch up with EIRSS coordinator Raquel de Pedro, help us set up the lecture room before the big day, checked that all her material had reached participants, quizzed me on my own research interests and entertained my toddler while I was sorting out last-minute arrangements. I must admit I was a bit star-struck. Prof. Angelelli is the guru of Medical Interpreting and her work is probably cited in every single research document in that field. She is an applied linguist with an unusual background combining Translation and Interpreting Studies, Social Sciences and Educational Linguistics. And yet here she was chatting to us with a huge smile on her face about research trends, differences in interpreting pedagogy, PhD training, not to mention language acquisition (because of my toddler’s age). This is definitely not an academic who rests on her laurels. During the EIRSS, she delivered a marathon 3-hour-long session on Research Design, asking fundamental questions such as “why do we do research?”, exploring dilemmas in research ethics and leading workshops. Her research interests could not be more relevant. Her work focuses on Medical Interpreting but also on cross-cultural communication with a focus on the role of interpreters as language mediators. She has published numerous books, of which Medical Interpreting and Cross Cultural Communication constitutes probably the most important reference in the medical interpreting field as well as the first ethnographic work in Interpreting Studies. Revisiting the Interpreter’s Role: A Study of Conference, Court and Medical Interpreters in Canada, Mexico and the United States is equally influential as it is the first valid and reliable measurement of the role of interpreters . You can find a full list of her publications here. That’s not all. Prof. Angelelli also developed the first empirically-driven language proficiency and interpreter readiness test for healthcare interpreting for The California Endowment and Hablamos Juntos. She is the President of the American Translation and Interpreting Studies Association, Director of the Coalition of Distinguished Language Proficiency Centers, and Advisor for the National Council of Interpreters in Healthcare and for Hablamos Juntos. She served as Director for the American Translators Association for six years and she is currently the World Project leader for the ISO Standards on Community Interpreting. And the best part? As of June 2013, Prof. Claudia V.Angelelli is transitioning from SDSU, California to Heriot-Watt University joining the vibrant community of scholars at LINCS. Welcome to LINCS, Claudia Angelelli. A New Research Centre is Born! A new centre was recently established at LINCS to complement and work alongside the well-established Centre for Translation and Interpreting Studies in Scotland (CTISS). The Intercultural Research Centre (IRC) addresses key intercultural issues arising from the changing global context. It makes original contributions to the study of interculturality with particular reference to dimensions of living culture in European societies. This cluster focuses on the endogenous development of communities, localities and regions, the relationship between culture and place, and utilisation of heritage as a resource. At the IRC, we welcome enquires from academics and research students interested in collaborating with us on any of these research themes. IPCITI week at LINCS, Heriot-Watt! IPCITI 2013 is taking place at Heriot-Watt University on the 14th-16th November. The conference is the result of a long-term collaboration between Dublin City University, Heriot-Watt University, the University of Edinburgh and the University of Manchester, and our university is hosting it for the first time in four years. The IPCITI 2013 Organising Committee has worked hard to put together a diverse and enriching programme which will be of interest to postgraduate students across all areas of Translation and Interpreting Studies. First of all, we would like to already thank colleagues who have supported us and helped us in different organisational spheres (you know who you are), although we will do this individually at the opening of the conference. We are well aware that this is an event where support and collaborative efforts are crucial for IPCITI 2013 to take place. Setbacks would not be overcome otherwise. IPCITI aims to create an environment where research and academia can be accessible and enriching in real terms. It is a unique opportunity for postgraduate researchers to share and discuss their research among peers and benefit from your research expertise in a supportive and intellectually stimulating environment. Please put the conference schedule down in your diaries, and have a look at the programme. We look forward to seeing all delegates next week at IPCITI 2013. Research and Professional Translators and Interpreters: An odd couple? That is a question I asked at the recent BAAL conference. Without fail, all the researchers here in LINCS, from the newest PhD student to the most experienced professor feel that research is not only interesting but useful too. We have seen projects on lifting standards in police interpreting, improving public service interpreting training, ethics and user expectations. These projects have all aimed not just to look at what is going on in “real-world” translation or interpreting but to point the way towards change. Yet the sad fact is that, even if researchers were to discover a way to revolutionise the industry overnight and triple the pay of translators and interpreters, their work is likely to fall on deaf ears. With a few exceptions, few translation and interpreting professionals will wake up with a great urge to read research journals or comb over a book of conference abstracts. Like it or not, most research is carried out by researchers, read by researchers and applied by researchers. It doesn’t have to be this way. Many of the projects going on in LINCS today and even some that are now completed have taken place in partnership with non-academics. These might be police officers, interpreting users or even interpreters themselves. From the outset then, these projects have involved professionals in work that interests them, includes them and hopefully can have a positive effect on them. But much more needs to be done. Only a few weeks ago, this blog hosted a lively discussion on why deaf people often don’t get involved with research on deafness or sign language. Now it is time to throw the net out in another direction. If you are a professional translator or interpreter, what are the major barriers that put you off getting involved in research or even reading it? What topics do you wish research covered? 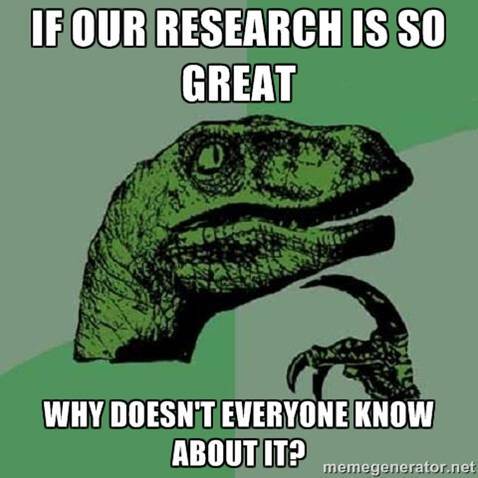 What would be the best way for researchers to appeal to you?